ELBA’s Built-In Ovens are appliances that are installed directly into the cavity of your kitchen cabinets, creating a seamless and streamlined look to your kitchen whilst saving precious floor space. If you are redesigning your kitchen, it's good to know that built-in ovens can be installed in-column, at waist-level, or under your countertop. 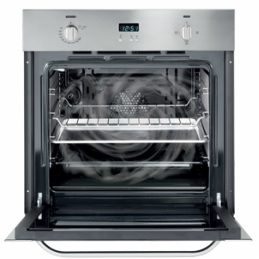 ELBA’s ovens come loaded with class-leading features and striking aesthetics that are sure to bring out the designer in you. It is important to first identify where the oven will be placed in correlation to the design of your kitchen cabinets; built-in ovens can be mounted in-column or under the countertop. Consult with your interior designer and decide on the type of installation you prefer and then choose the type of oven and the various designs available. If gas is something you are more familiar using, you’ll be pleased to know that there an ELBA fan assisted gas oven that helps circulate the heat generated by the heating elements to yield faster cooking times (*compared to regular gas ovens) that will result in evenly cooked dishes all throughout. Furthermore, the powerful gas grill is perfect for adding the finishing touches of crisping, browning, or grilling to create that perfect dish! ELBA's built-in ovens provide you the flexibility and freedom of customizing your work space at home so you can handle any recipe and enjoy your kitchen. With high performance features like catalytic self-cleaning panels, active venting, touch screen controls and a multifunction program mode, these ovens are sure to be a big part of your culinary experience. ELBA’s electric convection ovens enable you to explore the chef within you with its highly versatile multi-function programmer that has (up to) ten cooking modes with various heat and fan combinations to help you carry out that recipe you’ve always wanted to try. 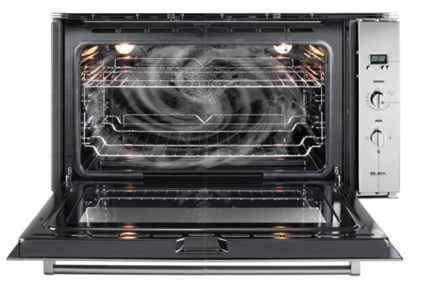 Constant heat circulation enables balanced temperature distribution to ensure perfectly even dishes with (up to) 30% reduced cooking times (*compared to static ovens).